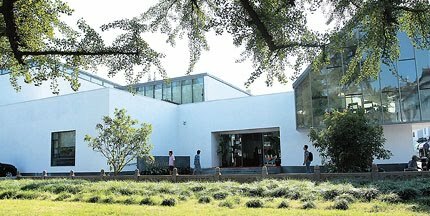 China: 50 kilometers from downtown Shanghai in Qingpu District you can find the Zhujiajiao Museum of Humanities and Art, with an exhibition of oil paintings and sculptures that tell the story of the town. It is part of the local government's plan to set the town apart from other charming water towns by promoting its cultural heritage. Two 479-year-old Ginkgo biloba trees were removed for construction of the museum and were later replanted in front of the building. "Though we lost exhibition space, we finally saved these two trees that were witness to history, so newcomers should take a stroll outside the museum as well," says Yu Xiaofu, who is in charge of the project. Ďakujem za informáciu o preseadení stromov Ginkgo biloba (vek 479 rokov) v Číne (50 km od centra Šanghaja) pri výstavbe múzea. Zaujíma ma spôsob presadby (čiastočné zrezanie konárov, úprava koreňového balu, rozmery stromu, výška, šírka koruny) a footodokumentácia stromov po vysadení!Ginkgo má dobrú koreňovú a pňovú výmladnosť! Pozdrav pre všetkých milovníkov stromu Ginkgo biloba!